Chicago is a big, vibrant, and culturally diverse city, which makes it perfect for fun nights out on the town. Some spots in the Windy City are especially perfect for couples looking for beautiful views, cozy bars, and romantic places to stroll. Here are a few ideas for planning the perfect romantic date night in Chicago—all you need is a limo service to take you there with that special someone. The Second City comedy club is a major landmark, both to comedy and Chicago itself. The venue’s sketch shows are always different, making Second City a great spot for a lighthearted, laugh-out-loud date night. Improv newbies and aficionados alike will enjoy arriving in style for a night of drinks and fun at this legendary Chicago institution. Don’t expect to catch the latest hit films at the Music Box Theatre—it’s only old classics, independent movies, and fascinating documentaries here. A date night at the Music Box is the perfect opportunity to try something new and is sure to lead to some interesting, intimate conversations on the limo ride home. And if the night is going too well to end it early, have a few drinks together in the theater’s lounge after the credits roll. 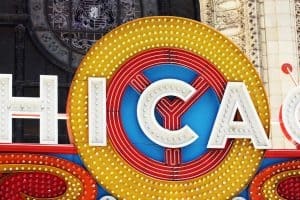 A night out at Chicago’s Civic Opera House is perfect for couples looking for a fancier evening. This dazzling theater is home to the Lyric Opera company, one of the most revered in the United States. If opera’s not your particular cup of tea, the venue also hosts regular music concerts every now and then. But no matter what is showing on your next date night, passersby will notice when you pull up on Wacker Driver in a stretch limousine. The Riverwalk is still relatively new, so it may be a whole new experience for couples out on the town. The spot boasts gorgeous views of Chicago’s downtown, not to mention numerous cozy spots to stop for a cocktail or a romantic dinner. With so much to do and a long stretch of water to stroll beside, plan on spending a little extra time to really enjoy the sights. Echo Limousine offers limo and car services for a wide variety of occasions, including romantic evenings and special events. To add a limo service to your next date night, book online or contact us at (773) 774-1074.